The 1970s were a golden age of disaster movies and books; skyscrapers burned down, nuclear reactors melted down, and earthquakes leveled cities. 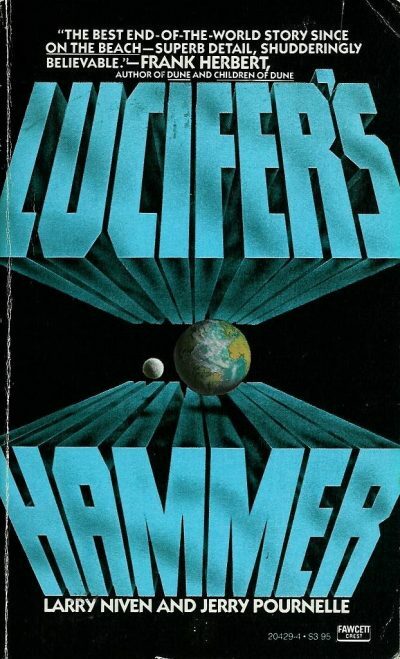 First published in 1977, Lucifer’s Hammer was a late entry into that genre0 but what it lacked in timing it made up for in scale; where previous entries had wrecked cities, Hammer smashed the planet and where others killed hundreds, Hammer killed billions. It’s a shame, therefore, that one could easily envision D.W. Griffith filming it and not for the spectacle. Disaster stories tend to have a pretty standard design, with three important elements. In the first, we meet the cast of characters; often the disaster is foreshadowed at this point and it might be explained in detail. In the second, the event occurs, and we see how various characters deal with it. In the third we see the aftermath of the disaster, with hints of the new world to come. How much attention is given to each element can vary wildly but they are almost always present and Lucifer’s Hammer fits this model fairly closely. The story begins probably 1980ish 1 when millionaire astronomer2 Tim Hamner co-discovers comet Hamner-Brown. The comet has never ventured into the inner system before - its tragic back story, more detailed that that given to many of the characters, is provided in flash-backs – and by all the odds it should just pass through its perihelion a little diminished by solar heat and head back out into the dark. Unfortunately for Hamner-Brown, there’s a planet in its way. A planet named Earth! There are indications that Hamner-Brown might be bad news for the Earth (although the nature of cometary orbits, the primitive computing of the era and the limited astronomical resources of the Earth at the time 3 makes exact prediction impossible), but at least in the early stages people dismiss the possibility of an impact and the focus is more on studying the object than worrying about something the size of Mt. Everest slamming into the Earth. I regret to report not all of these people will see the final credits roll. The person who ends up being the linchpin of the good guys is self-confessed politician Senator Jellison. Jellison is a major player in the effort to get Americans up in space to study the comet, he is the one who happens to own a rather baronial estate in the High Sierra, the part of California that will survive what is to come and unlike poor Hamner, Jellico is going to continue controlling his land. Of course portions of Hamner-Brown hit the Earth because nobody is going to buy a novel about how the Earth wasn’t hit by a comet . Due to the scale of the Earth, the effects of each impact, described in loving detail, take enough time to reach the characters for them to understand what a pickle they are in and to try to reach safety. As tsunamis race around the planet and vast quantities of sea water are evaporated only to fall as a Biblical floods elsewhere, entire nations are wiped from the face of the planet and it becomes a whole lot easier to keep track of all the living characters. The High Sierras survive tsunami and flood; enough survives that Jellison and his subjects are able to put together a functional-enough society. Given time, they might provide a seed for the next round of civilization, but not only do they have to survive the first winter (and the effects of comet-induced climate change) but Jellison himself is in delicate heath with no clear successor. Worse, a vast army of cannibalistic blacks, left wing politicians, environmentalists, union agitators, religious loonies and other second-handers are on the march towards Jellison’s domain. The right-hand edge of the wave impacts against Antarctica, breaking off glaciers ten miles long and five wide. The wave bursts through between Africa and Antarctica. When it reaches the wider expanse of the Indian Ocean the wave has lost half its force: Now it is only four hundred feet high. At four hundred and fifty miles an hour it moves toward India, Australia and the Indonesian islands. It sweeps across the lowlands of southern India, then, focused by the narrowing Bay of Bengal, regains much of its strength and height as it breaks into the swamplands of Bangladesh. It smashes northward through Calcutta and Dacca. The waters finally come to halt at the base of the Himalayas, where they are met by the floods pouring out of the Ganges Valley. As the waters recede, the Sacred Ganges is choked with bodies. Even if the wave is still 120 meters high when it reaches India, which seems doubtful, and even given the lamentable geography of many locations in India, there is no way that wave is going to reach the Himalayas. This ties into something I will mention later. There’s an interesting detail missing from the catastrophe because of when Lucifer’s Hammer was written. Lucifer’s Hammer predates the Alvarez Hypothesis by three years and the modelling that followed and nobody at the time (at least in the sources the authors used) seems to have realized that secondary impacts from debris blasted out from the initial strike zones would accompanied by a significant release of radiant energy as the debris rained down. Being on Earth after a major impact will have many of the benefits of being in a convection oven as the sky glows and fires sweep the planet. “Oh, we’ll get hit someday. It probably won’t be an asteroid, either. The orbits are too nearly fixed. There must have been asteroids whose orbits intersected Earth’s, but those have had four billion years to hit us, and most of them eventually did,” said the lecturer. “They hit so long ago that even the craters are gone, weathered away, except for the biggest and the newest. But look at the Moon! The lecturer’s pointer traced a parabola drawn in chalk. “Some mass way out there beyond Pluto, maybe an undiscovered planet … we even have a name for it. Persephone. Some mass disturbs the orbits of these great snowballs, and they come down on our heads in a wake of boiling chemicals. While the models suggest comets hit the Earth , and we’ve certainly seen Jupiter get nailed repeatedly, evidence for impacts unequivocally due to comets is oddly sparse. The population of Earth-crossing asteroids is constantly replenished thanks to bodies like Jupiter, and on time scales a lot shorter than it takes comets to tumble down from the Oort or the Kuiper. Before the sun burned, before the planets formed, there were chaos and the comets. Chaos was a local thickening in the interstellar medium. Its mass was great enough to attract itself, to hold itself, and it thickened further. Eddies formed. Particles of dust and frozen gas drifted together, and touched, and clung. Flakes formed, and then loose snowballs of frozen gases. Over the ages a whirlpool pattern developed, a fifth of a light-year across. The center contracted further. Local eddies, whirling frantically near the center of the storm, collapsed to form planets. The car wouldn’t be reported stolen for hours. Alim Nassor was pretty sure of that, sure enough that he would sit in it for another ten minutes. Alim Nassor had been a great man. When he had made himself great again, he would have to hide what he was doing now. Before he was great he had been George Washington Carver Davis. His mother had been proud of that name. She’d said the family was named for Jefferson Davis. That honky had been a tough dude, but it was a loser’s name, no power in it. He’d had a lot of street names since. His mother hadn’t liked those. When she threw him out he took his own. are likely pure Pournelle. It’s not that Niven is the champion of amicable race relations, because we all know he isn’t, but having a black woman being proud of being named after the President of the so-called Confederate States of America is the sort of detail I’d expect from the fellow who came up with the totally authentic name Ifnoka. The only good thing about Hammerfall, women’s lib was dead milliseconds after Hammerstrike…. suggest the author simply forgot to include that detail. Harvey sat, motionless, then deliberately looked across the fire to where his son lay sleeping with his … his woman. A woman he’d won by conquest, rescued. I find myself somewhat pessimistic about how long Maureen’s efforts towards mitigation would last, especially since due to the nature of the New Brotherhood Army the slavers will tend to be white while most of the non-white population is going to be performing uncompensated labour in the fields. Once the honkies had poured bread into the ghettos, bribes to stop riots, and Alim had taken his share. Not just money; there was power, and Alim was known in City Hall, was headed for something bigger. Some fans of the pair might think certain elements in their fiction showed up after the Rodney King riots but nope, they were there right from the beginning . The Russians retaliate in kind, assisted by the US 6. “The thing is, if we ever get to Russia we’ll find nothing but glaciers. But if we go to China we’ll find Russians, and they’ll remember us as allies. and the advantage of invading a radioactive, Hammerfall-smashed China over invading a Hammerfall-smashed Europe is not at all clear, unless perhaps it was ridding the world of the Chinese that was the whole point. On the plus side, the desperate hand-jobs to fans and fellow writers are less blatant than they were in Footfall (or Fallen Angels) and I did like the hippy postman’s determination to deliver the mail despite the end of the world. I cannot really recommend this as a novel but as a tour of the anxieties of the mid-1970s and the authors Ids, this cannot be matched. 0. As the story goes, the timing is probably not a coincidence. The novel began as the story of an alien invasion that happened to include a deliberate impact, as in the late Footfall. The editor, no doubt aware of the flood of disaster flicks in the early 1970s, didn’t care for the aliens but liked the impact scenario. 1. The space technology discussions are filled with references to 1970s-era machines. 2. The two are causally connected in that being a millionaire allowed Hamner to be an astronomer but should not be read as hinting that the path to wealth and fame is through an observatory. 3. As the saying goes, at this point more people worked in any given MacDonalds than were actively looking for objects that might hit the Earth. 4. Although you could write a fine novel about that, I am sure. Los Angeles’ second black mayor. He’d kept to a winning game: He was tall and fit and dressed like a wealthy professional man, which he’d been before getting into politics. His mixed blood showed, and his education showed because he let it. Bentley Allen was not going to talk down to people. He didn’t need the political jobs; he was technically on leave from a tenure appointment on the faculty of a wealthy private university. I bet I would get a lot more out of this book if I knew more about the political history of Los Angeles. 6. The US may have been influenced by the fact Chinese missiles could not reach the US but Russian ICBMs could.